Congratulations to our upper school journalists on the inaugural issue of their school newspaper, Patriot Press. The theme for this first issue, published on February 5, 2019, is "New Year, New Me" and pays tribute to fresh starts and new resolutions. 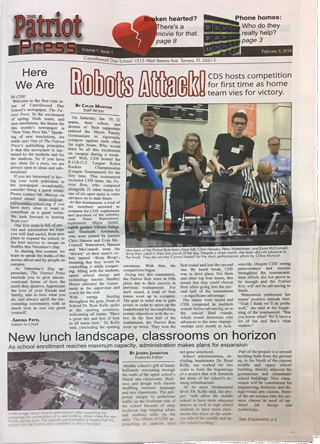 This issue of the paper also has feature stories about the CDS Patriot Bots, our competitive Robotics Team and an interview with Dr. Kelly about major expansion plans that are on the horizon for CDS. In addition to news stories, this issue includes an opinion page, athletic news, restaurant, movie, and music reviews, and more. Copies of the Patriot Press were distributed to all upper school students last week. In her welcome column, Sarina P. ('20), Editor-in-Chief writes, "In sharing this content, we hope to speak the truths of the stories about and by people on campus." The paper strives to be sustained by and for the students and encourages them to submit ideas for stories or their own work to be published in the paper. Patriot Press is produced under the guidance of US Language and Literature teacher, Mr. Sean Marcus.